There are several short potential moments a day you can use to convince your clients of your ideas. 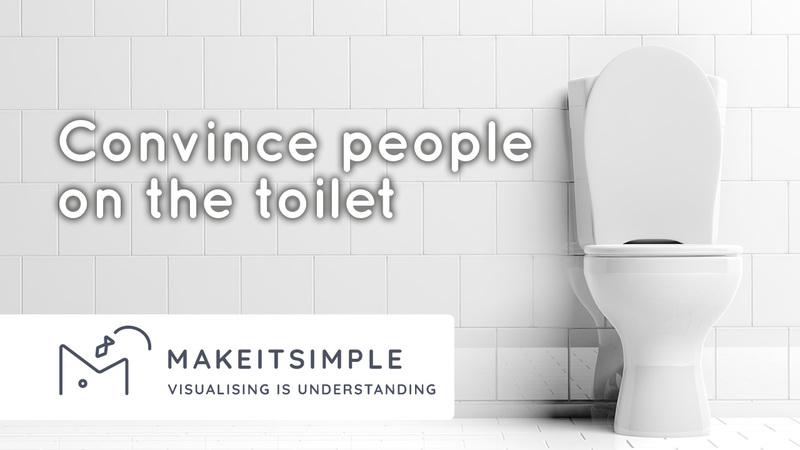 A toilet visit is one of them. So this afternoon I was sitting on the toilet. I know. It’s something all people do and that’s what makes it even more interesting. What I’m trying to say is; there are a lot of small moments in a day. You know when you are standing at the bus stop or you have to wait for somebody. These moments are really useful for companies that use videos to promote themselves. So if you have a clear story and it just takes a few seconds. Maybe a minute at max, people see that video in the short time it takes. They go to your website they scroll through the details and you might convince them of your story. Which means if you have a product you might sell something. Or if you have a service you might get a call out of it. My company Make it Simple is specialized at making these stories small and compressed and interesting to watch. With animated visuals. And if you put this on on your social feed it might help you to get your clients to visit your website to understand what your company really does and that might lead to another conversion. Thanks for watching my name is Gijs Habraken from Make it Simple and I see you guys next time.